I had a fantastic weekend at the Fall Superior Trail races this year. I have started getting more and more interested in trail running, and also in some ultra distance events. The Superior Trail races were some of the first races I found in the Midwest, and immediately caught my attention. I was starting to think about doing the 50k, and thought it would be great to go up and volunteer to see the course, checkout the event, and get my first training run in. A few emails with Larry and Maria and my friend Tim and I were assigned to the Sawbill (Britton Peak) aid station. There are 3 distances in the Fall races: marathon, 50 mile, and 100 mile. 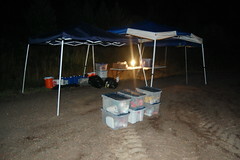 Our aid station is at mile 90 for the 100 mile race, 39.5 for the 50 and and 13.3 for the marathon. We got a bit of a late start and didn’t get up to the North Shore until evening. It was amazing to look off into the darkness to our left and think about all of the runners who had been going since 8:00am. It was dark. We got to the Sawbill parking lot around 9:30pm and met Dale and his family, who have worked this station for about 12 years. We took a few minutes to chat, but all quickly turned in as we had a long night ahead. We crashed and got a few hours sleep Friday, before being awakened by the UHaul when our station was dropped off at 1:30am. We met John Storkamp and his crew via headlamp (John is Race Director for the Afton Trail Run), and they dropped the bins and helped us pitch the canopies. Dale slept through the drop and we had no clue what we were doing, so we did some math and figured we could sleep until 3:15am and then get up before the first runner was coming in. 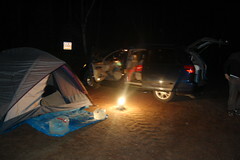 We barely got back into the tent and were awakened at 2:00am when the first runner’s crew rolled in. It turns out Chris Gardner was burning up the course and was planned to be in around 2:30am. We opened up the station, Dale joined us and built a fire and were in business – rifling through bins to unpack and organize the food. Chris arrived ahead of schedule and looked amazingly alert and strong. This was my first ultra and I could not believe how fresh he looked. He barely touched our table, got what he needed from his crew and hit the trail. Adam Harmer dropped out early due to achilles issues, but fortunately for us dropped by our station to cheer on friends. We had a great chat by the fire while waiting for Joe Ziegenfuss to come in. Joe was in decent shape, but was followed by a runner named Matt Aro who looked rough (I guess setting a 100 mile course record a few weeks before was a factor!). It was a rush to see those headlamps come bouncing through the woods and hear someone shout “Runner!” We caught another nap by the fire and then by daybreak more crews started showing up. 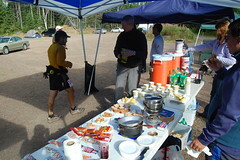 Brent Bjerkness snuck through our aid station in 4th without needing much. Helen Lavin was the next runner through. Again, I could not believe how fresh she looked. She chatted away casually while changing socks, had a bite, and then jogged the uphill trail away from the station. Starting about 6:00am we had a steady stream of runners for the rest of the day. We put out the best spread we were able: fig newtons, chopped up salted nut rolls, M&Ms, bananas, grapes, peanut butter and jelly sandwiches, cheese sandwiches, chicken noodle soup, warm potatoes, Hammergels, HEED, water, and pop (Coke, Mountain Dew, Ginger Ale, Sprite). As soon as runners came in we filled their hydration packs and water bottles while they grazed. We helped them find drop bags if they had them, packed them up with gels and sent them off. A lot of runners had trail and terrain questions, and I was feeling bad that I didn’t know the trail well enough to tell them about the next sections other than mileage. 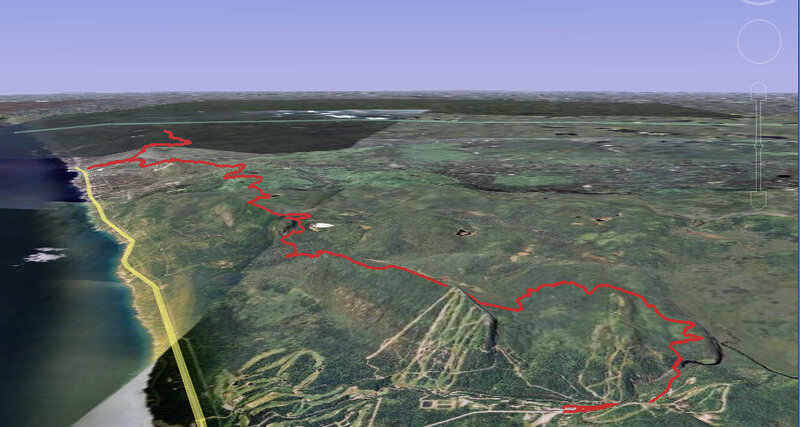 We were 5.5 miles from Oberg Mountain (the last station), and that was 7.1 miles from the finish. Some bees got kicked up somewhere earlier on the trail, and tons of runners came in with multiple bee stings. It sounded miserable, and we handed out swabs like crazy. A lot of people asked for ibuprofen, etc. but we were evidently unable to provide any. I was really struck by just how cool everyone was. Throughout the day we had great conversations with all of the runners and crews. Many crews arrived early and we had a great time with them. The runners were exhausted but all were very polite and vocally appreciative of the volunteers. It was a great atmosphere all around. Since I was partially there for reconaissance, I was fascinated to check out all of the gear people used. I would say there was a very even split between waistpacks, backpacks, and handhelds for hydration with maybe a slight tilt towards backpacks. Almost everyone had serious trail shoes – a lot of Salomon, North Face, and Innov8. Keith was a notable exception running the 50 mile in his Vibram FiveFingers – that is so incredibly amazing. Christian was wearing the New Balance 800s that I have my eye on. Dirty Girl gaiters were very common (there was a last minute frantic thread on the ‘straces’ Yahoo! Group on them). I found it very interesting that the general brand presence was very different from road races. Not a lot of Nike, Addidas, Asics. Very heavy on REI-ish brands – North Face, Salomon, Petzl. Hydration and fuel were also fascinating to check out. A lot of people were using S! caps for electrolytes. We went through Hammergels like crazy, and a lot of runners came through saying they were eating 3 gels per hour! HEED was not quite as popular as I thought it would be, but that could be a symptom of the lateness of our station. People went nuts on Coke and Mountain Dew. Chicken broth and potatoes were also a hit (I was pushing them pretty hard – I loved them! ), as were peanut butter and jellies. One guy caught my attention by saying that he always does 100s with just solid food – no gels. That seems like a great way to do it if you can, but very challenging. We had a steady stream of runners all day until we closed up around 6:30pm. We had one voluntary drop, but didn’t have any time cutoffs which was nice. The rain picked up while we packed everything away and loaded the UHaul. After shutting down, we then dropped by Oberg to cheer on some of the late runners we had earlier sent off. Sandwiches and awards and cheering kept us going at the finish for a bit, and then we headed back to the Sawbill parking lot to crash for the night. We got up Sunday morning and set our sights on a training run. After quick breakfast and packing the tent, we headed to Caribou and found the trailhead. We spent the next 3 hours doing the Spring 25k route – an out and back from Lutsen to Oberg Mountain, with some breaks to enjoy the views. It ended up being around 14.4 miles total. The terrain is amazing technical – full of loose rock, buried rock, and exposed/eroded tree roots. We could run short segments, but spent most of that time constantly watching about 8 feet in front of us and trying not to land on something or lose our footing. We had to speedwalk tons of technical sections and huge climbs – using MotionBased elevation correction there was 6800ft of elevation change. It took us 3:16 total to run that segment – a 13:24 pace!!! But it was an absolutely beautiful route and I loved every minute. Our run is over at MotionBased. I think I found my race. I’m doing the 50k in Spring for sure. Working Sawbill was a totally fascinating experience and I would definitely do it again. It was unbelievable to see these runners come through who had been going for more than 24 hours straight. Many people looked beat up, but it was incredible to see them get up and keep moving. It was fascinating to see all of the gear people used, the shoes they wore, how they hydrated and ate… I was soaking up everything. Very cool people running, crewing, and volunteering. The guy who kept telling us that his running 100 was “no big deal”. “no one cares about your pace except you – just make sure you don’t get hurt so you can run again next time”. True words. Hearing Barb Meyers talk about Scott’s insane experience at the Arrowhead 135 this year. Seeing all of the families show up to cheer their runners – what an inspiration. How pleasant and happy some of the runners seemed, even at 90 miles – Helen and Kami come to mind. The importance of pacers and crew. I think having a pacer would make all the difference, especially pitch black at night. And having a crew there to encourage you on also seemed to make a huge difference. Jasper Brown’s crew – wow!! Hands down the most enthusiastic crew we say all day. They headed down the trail jamming loud tunes to bring him in! Tim Roe from Wisconsin who we saw crawling out of his car in the Sawbill parking lot the morning after running the 100 mile, and not having the energy to drive back to Duluth. He slept in his car after all that! I felt bad we couldn’t talk him into any breakfast. I was stunned to think that watching the race from that station actually made 100 look accessible. Grueling for sure, tons of training required, but actually doable. These are great races, and I can’t wait to get back – as a runner, an aid station worker, or maybe even a volunteer pacer. I can’t speak highly enough of all the runners I saw that day – amazing job everyone! Fascinating. We spent two weeks up on the shore this summer and are very familiar with the locale, just love it up there. The aid station volunteer work sounds like a blast – let me know if you do it again – I’d consider joining if they need more hands, the race reports are great. And if you need a crew for your own attempt and find yourself a person short – let me know. I love the logistics-support stuff. Might be tough to fit into family schedules, but sounds fun and worthwhile. Full disclosure – I am not a runner! Thanks for sharing. I ran the 25k 4 years ago, then the 50k, then the 50 mile and DNF 2ce now in the 100. 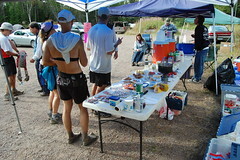 Hate to lose a great aid station volunteer but would love to see you progress to insanity and try the 100…. In a few years? Wow, this makes Grandma’s Marathon and all the organized road races around Minnesota look like a country club cake walk. I think I’m missing something by sticking to the pavement and that sub 3 marathon keeps calling. Will likely join in on the 25k next spring though. Peter: you definitely don’t have to be a runner to be a great crewmember. Thanks for the offer! I don’t know, but I’m guessing you don’t really need a crew for the 50k in the Spring, but supporters are always welcome! And they always need volunteers – I highly recommend that. Londell: thanks for your encouragement! The 100 still does sound insane, but who knows… it’s also sounds like a transforming experience to even try. Good luck to you! Brian: frankly they do look like that in comparison! I really think this is your kind of racing. Slay that sub-3 monster and then hit the trails. Hi Scott! Thanks so much for the great welcome (and chicken broth) at Sawbill. You guys were great. All the AS crew were – it means so much to every runner to think what people are doing for us. You should totally do the Spring race – I haven’t been up there in the spring yet but am planning on the 50K for next year. Glad to hear ye enjoyed a nice run Sunday morning! p.s. I’m in Ireland for 2 weeks but will mail you when I get back regarding training etc.